Check out these episode descriptions for the sixth and final season of the Girls TV show. Girls season six premieres on HBO Sunday, February 12, 2017 at 10:00pm ET/PT. Starring Lena Dunham as Hannah and Allison Williams as Marnie, the Girls cast also includes Jemima Kirke, Zosia Mamet, Alex Karpovsky, Adam Driver, Andrew Rannells, and Ebon Moss-Bachrach. Guest stars in the final season of Girls include Peter Scolari, Becky Ann Baker, Rita Wilson, Jon Glaser, Colin Quinn, Corey Stoll, Riz Ahmed, Matthew Rhys, and Tracey Ullman. Get the scoop, after the jump. Learn more about Girls season six from this HBO press release. Enjoying new success as a writer after participating in “The Moth,” Hannah gets an assignment that could change her life. Divorced from Desi, Marnie seeks to remain independent, but her self-absorption could undermine a budding relationship with Ray. New couple Jessa and Adam embark on a creative project that could become a source of contention. Shoshanna flourishes at a marketing agency, but realizes her friendships may be holding her back. In the final season of the Emmy®-winning HBO comedy series GIRLS, created by and starring Lena Dunham, these four familiar friends attempt to get closer to becoming the women they always envisioned – even as life sometimes gets in the way. Judd Apatow, Jenni Konner, Lena Dunham, Ilene S. Landress, Murray Miller and Bruce Eric Kaplan executive produce the show, which kicks off its ten-episode sixth season SUNDAY, FEB. 12 (10:00-10:45 p.m. ET/PT), followed by other half-hour episodes subsequent Sundays at the same time. In addition to Dunham, who stars as Hannah, the cast includes Allison Williams as Marnie; Jemima Kirke as Jessa; Zosia Mamet as Shoshanna; Alex Karpovsky as Ray; Adam Driver as Adam; Andrew Rannells as Elijah; and Ebon Moss-Bachrach as Desi. Returning guest stars on the sixth season of GIRLS include: Emmy® winner Peter Scolari and Becky Ann Baker as Hannah’s parents; Rita Wilson as Marnie’s mother; Jon Glaser as Laird; Colin Quinn as Hermie; and Corey Stoll as Dill. New guest stars this season include: Riz Ahmed (HBO’s “The Night Of”) as Paul-Louis; Matthew Rhys (“The Americans”) as Chuck Palmer; and Tracey Ullman (HBO’s “Tracey Ullman’s Show”) as Ode. Last year, GIRLS received an Emmy® for Outstanding Guest Actor in a Comedy Series (Peter Scolari). In 2012, the show won an Emmy® for Outstanding Casting for a Comedy Series, and has received 15 Primetime Emmy® nominations to date. In 2013, it was the only HBO series to be honored at the Golden Globe Awards, winning in the categories of Best Television Series – Comedy or Musical and Best Performance by an Actress in a Television Series – Comedy or Musical (Lena Dunham). 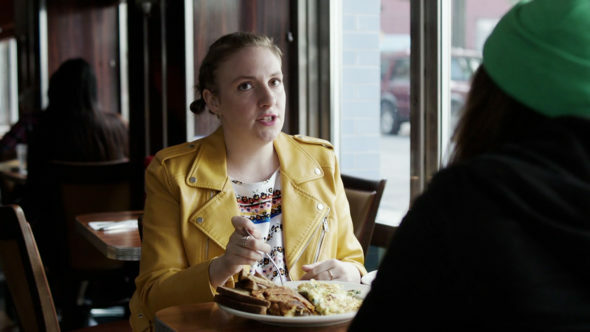 GIRLS was created by Lena Dunham; executive producers, Judd Apatow, Jenni Konner, Lena Dunham, Ilene S. Landress, Murray Miller and Bruce Eric Kaplan; co-executive producers, Tami Sagher and Jesse Peretz; supervising producer, Sarah Heyward. Is the Girls TV show ending at the right time? Should HBO have renewed it for season seven? What do you think?